Officials with the Nevada Department of Transportation made a special trip to the first Nye County Commission meeting of the year to provide the board with an overview of the nearly 28-mile, multi-million dollar improvement project targeting Highway 160 between Las Vegas and the Pahrump Valley. 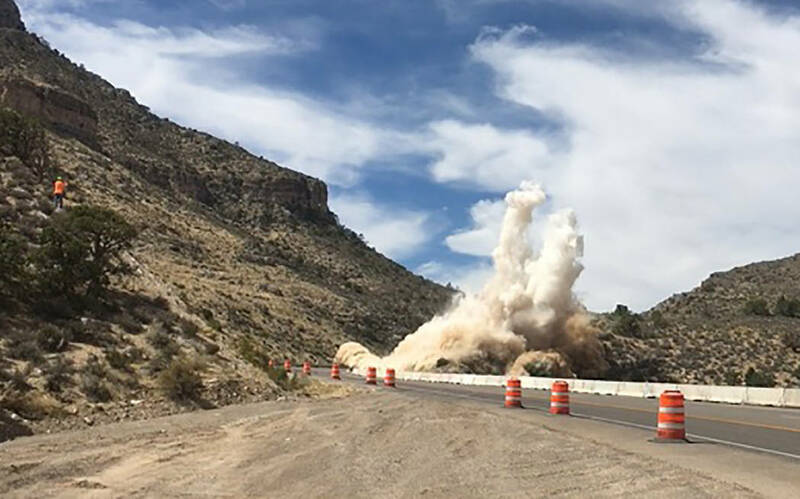 David Jacobs/Pahrump Valley Times Motorists must time their travels to and from Las Vegas in order to avoid possible delays due to blasting in the area. Drivers can expect delays from 30 minutes up to two hours during periods of blasting. Nevada Department of Transportation/Special to the Pahrump Valley Times Crews began blasting efforts along Highway 160, east of Mount Potosi Canyon Road, on Sept. 24, 2018. Blasting will continue until March, when a break of several months will occur before blasting resumes later in the year. 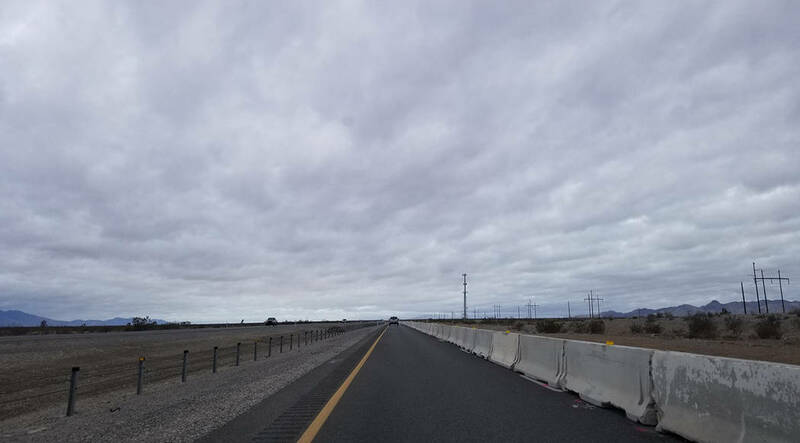 David Jacobs/Special to the Pahrump Valley Times A temporary barrier has been placed on the west-bound lanes of Highway, where traffic is being redirected to accommodate a roadbed modification project. David Jacobs/Special to the Pahrump Valley Times The roadbed modifications on the east-bound lanes of Highway 160 are expected to last roughly 11 months and will take place in three phases. During construction, both directions of traffic will be moved to the west-bound lanes. 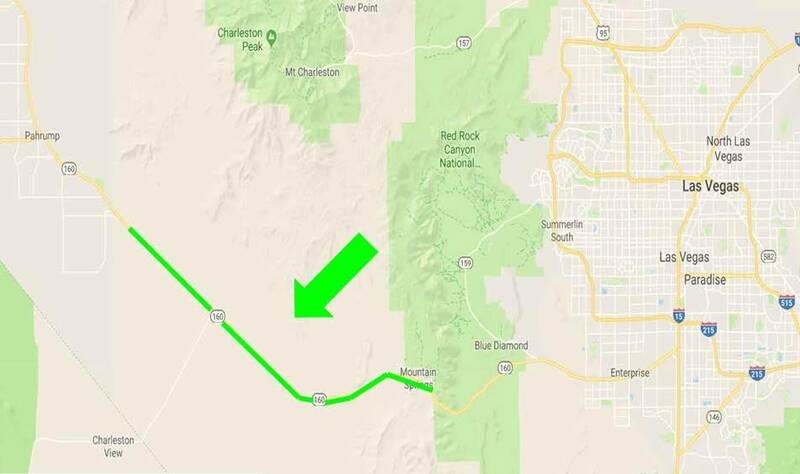 Special to the Pahrump Valley Times The Nevada Department of Transportation has begun a rebuilding and paving project from the Nye County line to the western edge of Mountain Springs along the eastbound lanes of Highway 160. The more than $59 million contract was awarded to Aggregate Industries in July, 2018. A project of high interest to local residents, the Highway 160 improvements have been underway since September of 2018. With such extensive work being done, motorists will have to deal with the construction for many more months to come as the completion date is pegged at July, 2020. NDOT Crew 906 Resident Engineer Don Christiansen detailed that the project actually consists of two distinct parts, both of which were wrapped into a single $59 million contract with Aggregate Industries SWR. “For clarity, I call one of them the mountainous area which is over Mountain Springs pass and down to the other side. The other I call the roadbed modification area, where the highway divides heading toward Pahrump and extending for about 22 miles to a little bit past the Nye County line,” Christiansen said. 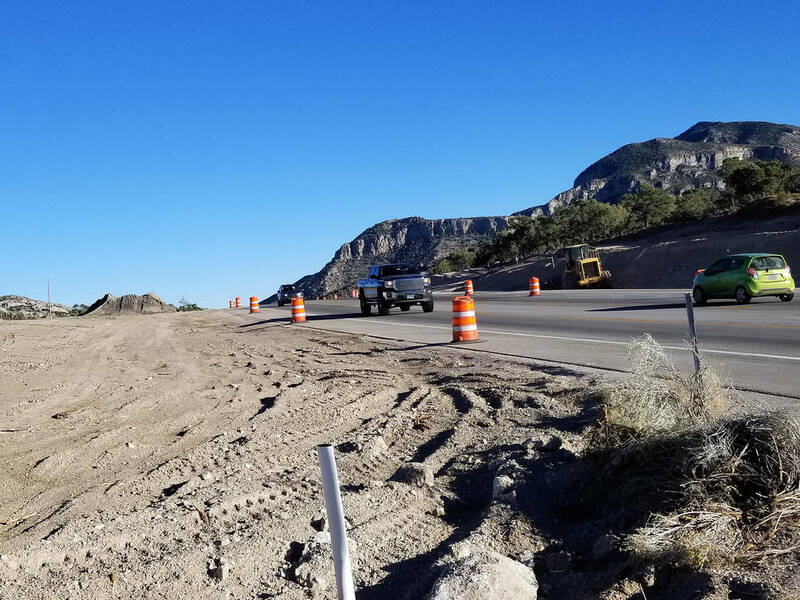 The mountainous portion addresses the Mountain Springs community where, due to safety concerns and the high number of vehicle crashes that have occurred there, the highway is being widened to include two lanes in each direction with a permanent barrier rail. Additionally, to provide safer and more convenient access for those who live in Mountain Springs, a new frontage road is also being constructed. While crews labor on the project, the speed limit has been reduced from 55 miles per hour to 35 through Mountain Springs and 45 on the eastern side of the community. Once everything is finished, the speed limit will be permanently lowered to 45 miles per hour in the entire mountainous region. To accommodate the new frontage roads and lanes, construction includes period of blasting, which have the potential to delay traffic for up to two hours. Christiansen noted that blasting is also permitted to be performed up to twice a week and two times per day. Blasting generally starts at 12:45 p.m. and will continue until March, when a break of several months will occur. Blasting will then resume again in the second half of 2019. Roadbed modification work includes rebuilding the east-bound lanes, occuring in three phases. Each phase will be seven to eight miles long and three to four months in duration, with the total project expected to take 11 months. While construction crews work in the area, all traffic will be redirected. As only the east-bound travel lanes are in need of repair, both directions of traffic will be shifted to the two west-bound lanes. For an added safety measure, barriers will be placed to separate those lanes and the speed limit, currently set at 70 miles per hour, will be dropped to just 55 miles per hour. “It’s basically a paving upgrade. It’s not changing the alignment or much of any of the safety features. It’s just rehabbing the pavement for those 22 miles,” Christiansen said, remarking that the roadbed modification was anticipated to begin within a couple of weeks.